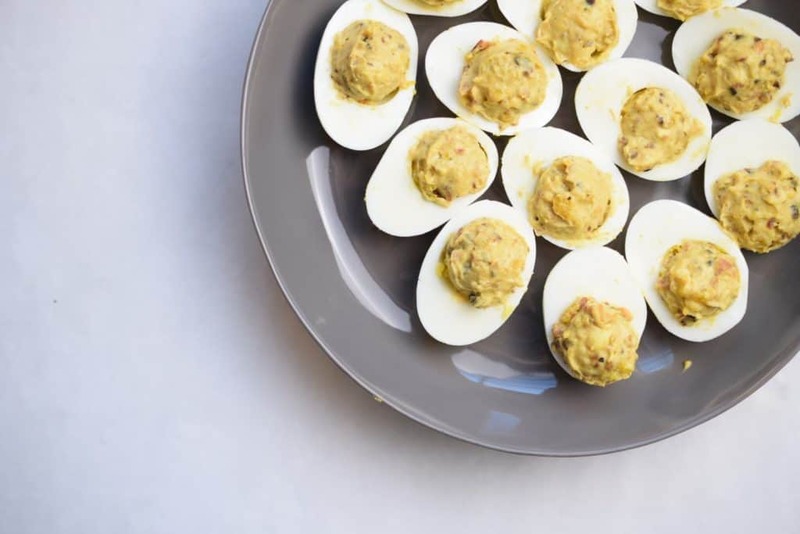 My husband’s favorite food is deviled eggs, true story. Yet, I rarely make them, not sure why that is. I decided to remedy that. 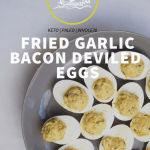 I wanted nightshade free, interesting version of deviled eggs to call my own, so I made fried garlic and bacon deviled eggs! Yes! 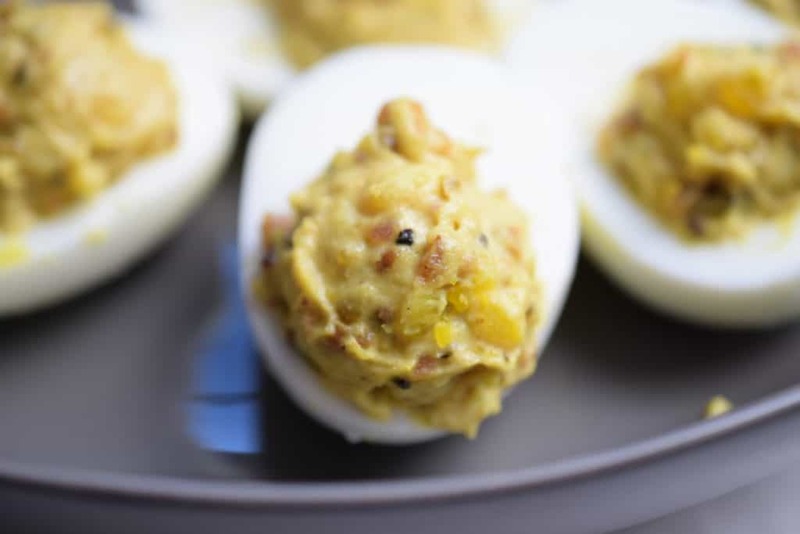 Adding bacon to deviled eggs is a no brainer. I also LOVE garlic, but raw garlic would be too harsh. While I had a skillet full of hot bacon grease, it occurred to me that I could FRY IT! 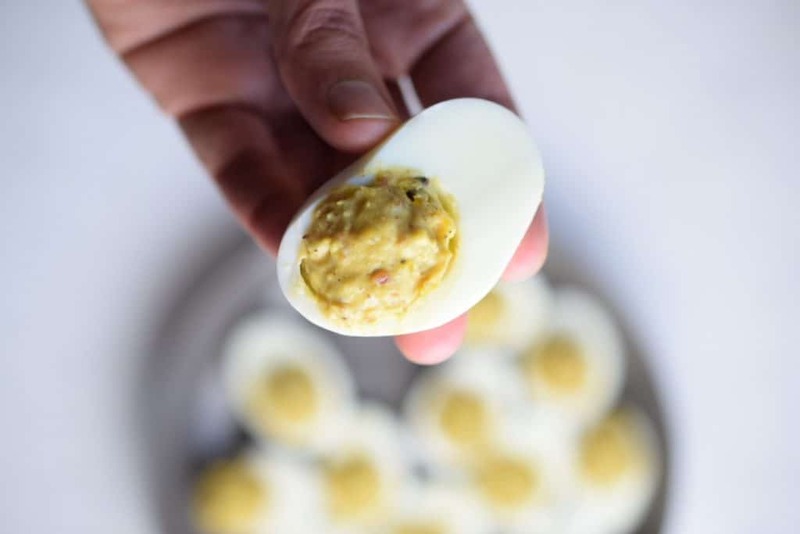 Then toasted, golden, crispy minced garlic morsels could grace these eggs too. I like to bring a large pot of water to a rapid boil. I add a bit of vinegar to the water. I gently add the 10 large eggs in the water with a wooden spoon and cook for 10 minutes at a rapid boil. Then I remove from the heat, drain the water from the pot and quickly fill it with cold water and ice. 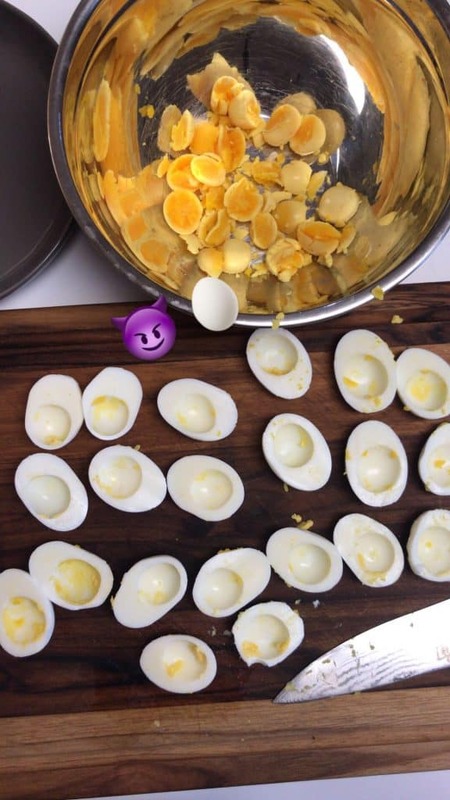 Let the eggs sit in ice water 2 minutes before peeling. 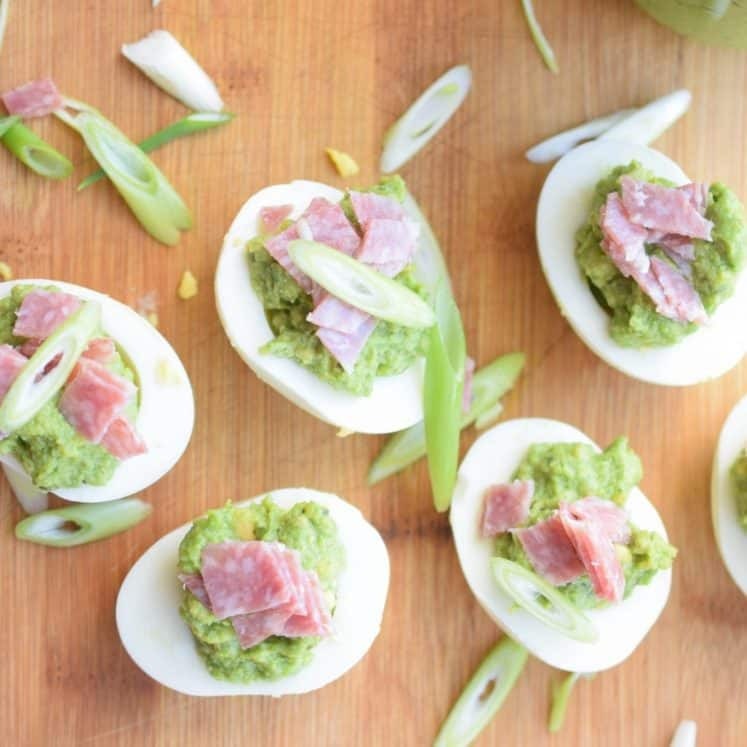 Bacon and crispy garlic deviled eggs! 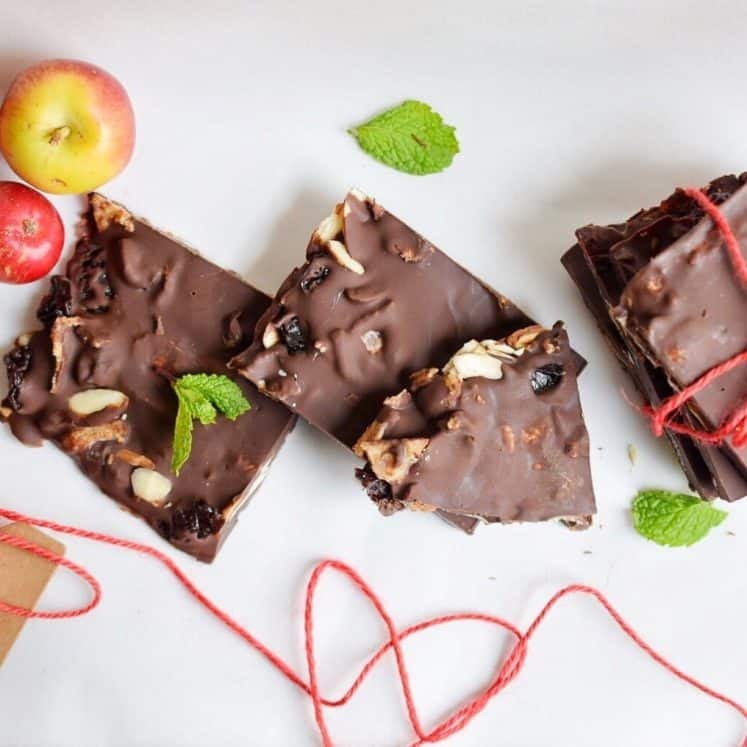 Delicious, keto and Whole30 compliant! 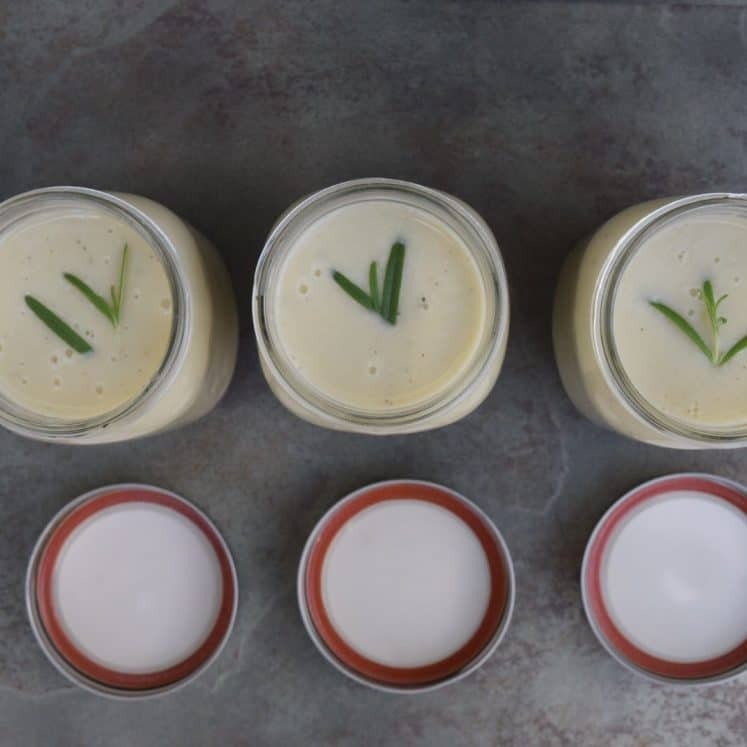 See post for how to boil the eggs. Heat a large skillet over medium heat. Put the bacon in the skillet and cook 5-6 minutes per side or until very crispy. Remove the bacon and add in the minced garlic. Fry in the fat until golden brown and aromatic. 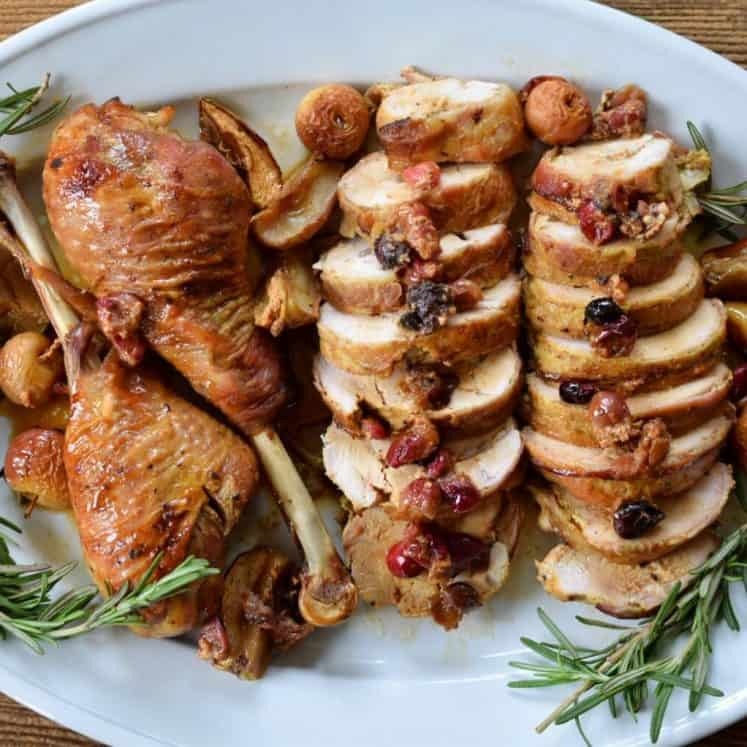 Use a spoon to remove from the fat and put on a paper-lined plate to drain. Halve all your eggs and gently remove the yolks. Add them all to a bowl and mix with the mayo, mustard, pepper, garlic. Mince up the bacon and add it to the bowl too. Mix well! Taste, add salt as needed. 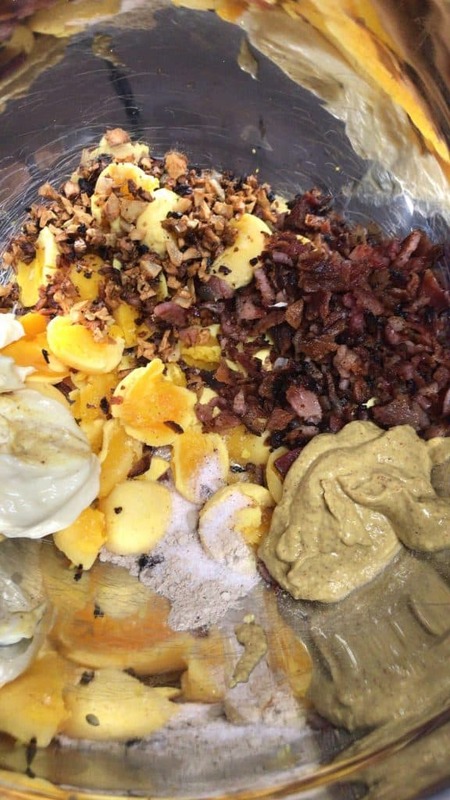 Use a small scoop or teaspoon to fill the egg whites with the fried garlic and bacon yolk mix. I used a small 1-ounce scoop to make then look all purdy! Enjoy! 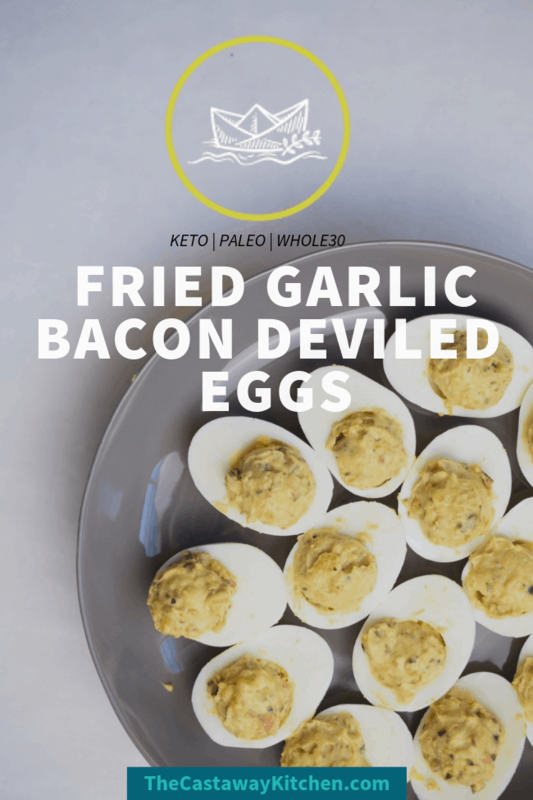 I just made these fried garlic and bacon deviled eggs and they are so delicious. 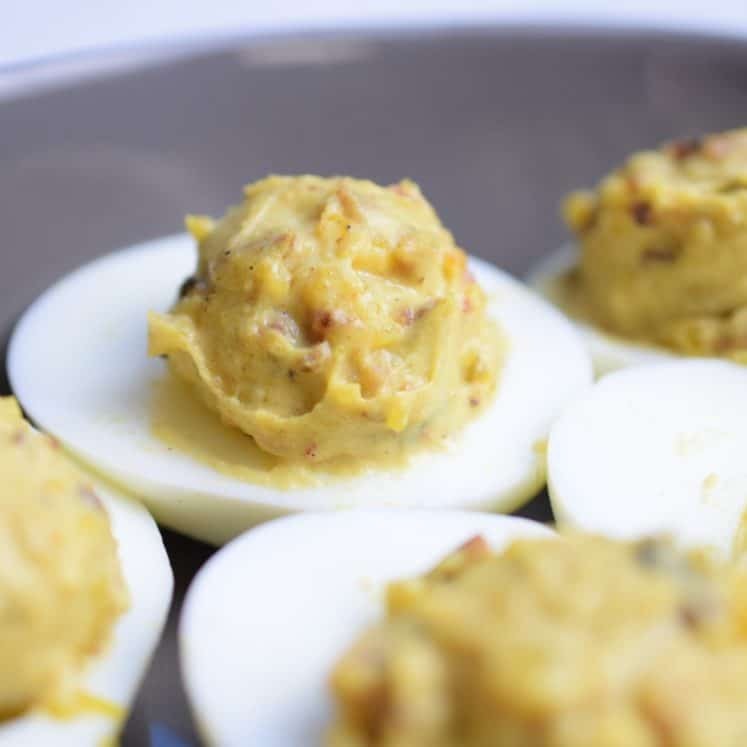 Such a different flavor profile for deviled eggs, I love the crunch of the bacon. 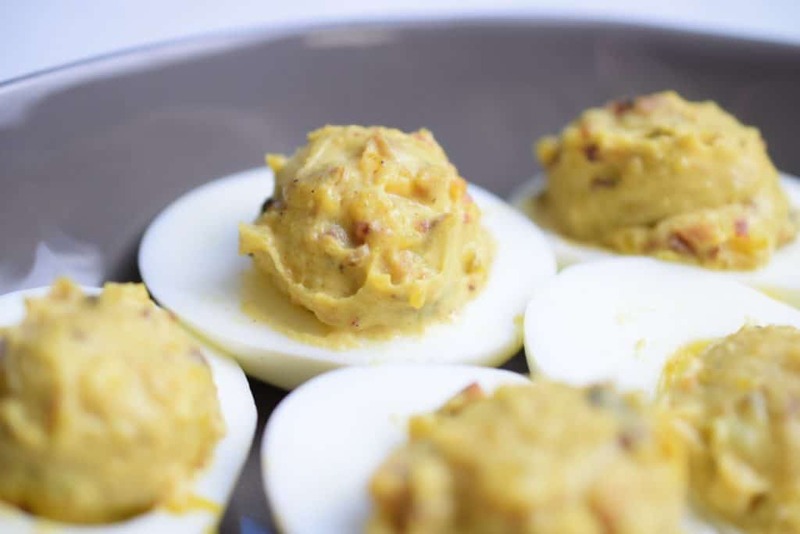 This is the best recipe for deviled eggs that I have come across, thank you for sharing it! That’s amazing! Thank you Nancy!